The charge you pay depends on the treatment you need to keep your mouth, gums and teeth healthy. You‘ll only ever be asked to pay one charge for each complete course of treatment, even if you need to visit your dentist more than once to finish it - either Band 1, Band 2 or Band 3. 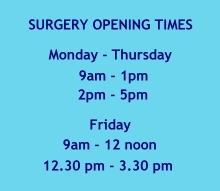 Some minor treatments, including having stitches removed or repair to dentures (if they can be mended) are free. This covers an examination, diagnosis (e.g. X rays), advice on how to prevent future problems, a scale and polish if needed and application of fluoride varnish or fissure sealants. If you require urgent care, even if your urgent treatment needs more than one appointment to complete, you will only need to pay one Band 1 charge. This covers everything in Bands 1 and 2 above, plus crowns, dentures and bridges. You may be eligible for free dental treatment or help with some of the costs. If you think you may be eligible please ask for the leaflet ‘NHS dental services in England’ leaflet, available from our reception.